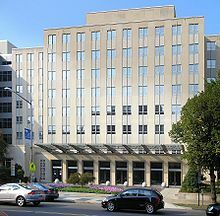 The Brookings Institution building near Dupont Circle in Washington, D.C. The Brookings Institution is an American think tank based in Washington, D.C. in the United States. One of Washington's oldest think tanks, Brookings conducts research and education in the social sciences, mainly in economics, policy, government, foreign policy, and global economy and development. In the University of Pennsylvania’s 2012 Global go-to think tanks report, Brookings is ranked the most influential think tank in the world. "to provide innovative and practical recommendations that advance three broad goals: strengthen American democracy; foster the economic and social welfare, security and opportunity of all Americans; and secure a more open, safe, prosperous, and cooperative international system". Brookings states that its scholars "represent diverse points of view" and describes itself as non-partisan. The media describe Brookings as "liberal-centrist" or "centrist". An analysis of Congressional records from 1993 to 2002 found that Brookings was referenced by conservative politicians almost as often as liberal politicians. It got a score of 53 on a 1-100 scale with 100 the most liberal score. The same study found Brookings to be the most frequently cited think tank by the U.S. media and politicians. ↑ "The Brookings Institution on Charity Navigator". charitynavigator.org. Retrieved March 4, 2012. ↑ 2.0 2.1 2.2 "About Brookings". Brookings.edu. Retrieved 2010-04-29. ↑ "Robert Somers Brookings – Brookings Institution". Brookings.edu. Retrieved 2010-04-29. ↑ "2012 Global go-to think tanks report and policy advice" (PDF). University of Pennsylvania. 21 January 2013. Archived from the original (PDF) on August 23, 2013. ↑ "Brookings Research | Brookings Institution". Brookings.edu. 2003-06-25. Retrieved 2013-08-27. ↑ Critchlow D.T. 1985. The Brookings Institution 1916–52: expertise and the public interest in a democratic society. DeKalb IL: Northern Illinois University Press. ↑ 9.0 9.1 "A measure of media bias. The Quarterly Journal of Economics 2005, Issue 4" (PDF). Retrieved 2013-08-27. This page was last changed on 16 November 2018, at 08:18.